Despite the proliferation of tools designed for road mapping, prioritization remains the most difficult part of the product. Without a process for roadmap reinforcement, it just won’t stick. Over the years, as a Product Manager, I established an effective product management process. With it and backed with strong strategy and leadership I helped develop roadmaps that aligned influential individuals and companies. Towards the end of any given quarter, I often rely on this fast-paced and collaborative 6 week process to refine priorities. I focused it on understanding the current state, identifying strategic opportunities, defining requirements, creating a vision of the future, and defining a staged plan to evolve the customer experience. Here’s my process broken down. Week 1-2, Initial Discover and Strategy Focus. I’ll spend the first weeks of the project developing a more detailed, shared understanding of the intent and objectives of the product’s current state. Without a sense of purpose and a scope to accomplish it, anything we do is equally ok. But once intent gets established I can start attacking it in a methodical way. I do that by setting objectives. I'll conduct an audit of the existing ecosystem to catalog the range of products, components, and features that will need to be ported to the new roadmap. I’ll also interview key stakeholders to get their perspective on which objectives will be most valuable to focus on. These sessions are used to identify key business strategies, customer motives and technical constraints that could impact the product roadmap. After defining the product Intent, Strategies and Objectives, I’ll dig deeper into highest priority needs. I conduct up to ten (10) customer interviews to gain a better understanding of known customer pain points and gain insights into latent needs to identify opportunities for improving the customer experience. Interview sessions may be conducted in-person, via phone, or via store intercept. I then propose an experience map to define the structure of the customer journey. A defined experience map facilitates discussions and proposes initiatives for how key features and components deliver measurable value to the product. I document the outputs of these sessions capturing the opportunity space into a feature wishlist parking lot. I’ll start the process with a collaborative conception workshop to get deep dive into the diverse range of wishlist features proposed. I’ll then bring together key stakeholders, decision-makers and subject matter experts to explore how these initiatives will need to evolve to align with strategic business objectives. I then refine and extend the best of these approaches. I’ll also identify high priority OKR’s (Objective and Key Results). A key target will be to take all that inspirational language and quantify it clearly by identifying and recording the value proposition, problems to be solved and success criteria. They will be used to focus stakeholders around a bold goal. At this stage, I’ll begin converging the OKRs into a unified roadmap to prepare for iterative development sprints. 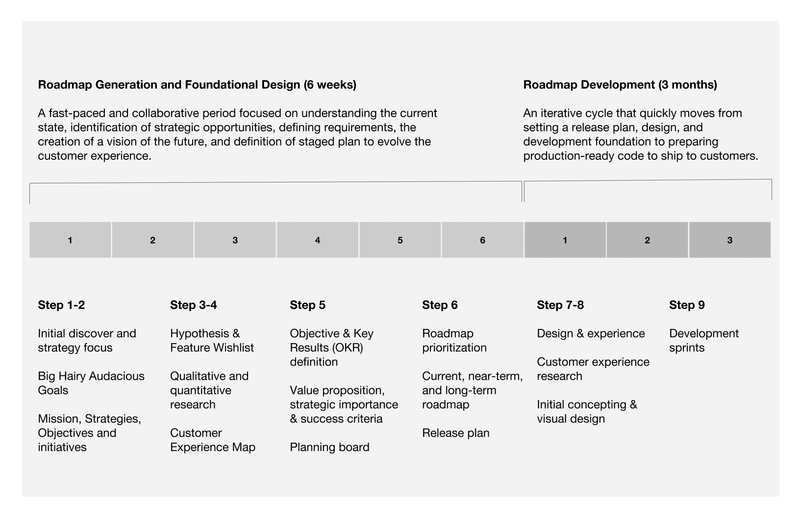 Roadmaps are essential to giving your organization direction, motivating teams and ensuring we deliver the right thing in the right time frame. An OKR sets a goal for a set period of time, usually the quarter. With key strategic and value propositions made, I’ll finalize with stakeholders the top OKRs using 1-5 ranking along customer, business, effort, and available resources aspects while making sure they make a commitment not to change ranking for 3 months. In parallel, I’ll work with engineerings and a project manager on a release plan for the upcoming quarter. The release plan includes requirements, committed available resources and a planned release dates for chosen initiatives. Over the next weeks, the UX/Design team and I will build wireframes that represent the key functional areas of the core user experience. In parallel, we’ll work iteratively on the visual presentation direction and begin converging the conceptual, visual, and technical workstreams into a unified design approach to prepare for iterative development sprints. I’ll also begin technical planning with the engineering team to explore different technologies and frameworks that will support technical, and experience requirements. In parallel, I’ll work with Data Science metrics collaborators on envisioning key feature uses. We'll identify measurable elements, making sure results are normalized and comparable so to tell me if an objective will be met. Not all products are created equal. This process tends to be sequential but you may experience it non-sequentially; it can also be an ongoing process. It comes down to gathering real-world feedback and making decisions on what features to build. Lay out very clearly what you learned about the actual customers, through qualitative or quantitative knowledge. State the additional problems you look forward to solving and propose solutions to grow the customer value while tying them to business results. Product management often lacks standards, here’s one you can use to succeed with digital products. Thanks to Judy Wong for reading drafts of this. Also, if you have any feedback or criticism about this article then shoot me an email.